Now Wedding Registered. Views of open farmland, woodland and miles of beautiful sky. As summer temperatures climb , our cool wedding barn with 14 inch walls keep you cool all day ! Stainton Manor Farm Rustic Barn venue is situated in the beautiful village of Stainton by Langworth, set in the Lincolnshire countryside between a medieval wood and a historical railway built in the 1840s giving an idyllic backdrop for a wedding day. This private but accessible venue is only moments away from the historic city of Lincoln with its beautiful cathedral and castle. We are now wedding registered so why not take advantage and get married in our beautiful barn or even outside under the blue Lincolnshire sky. The hire of Stainton Manor Barn Venue is separate to the additional internal decorations used to enhance the interior ……starlight ceiling with chandeliers, furniture and soft furnishings, drapes all provided at an extra cost by Mudfords of Retford. Please call or email to arrange a viewing of the barn. Bowser Brothers caterers provide in house catering for the venue. 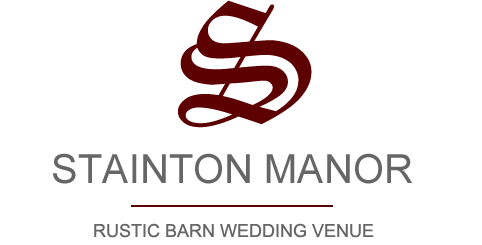 Stainton Manor Farm Barn can hold civil marriages and now can offer a beautiful barn recently converted from an old chaff house and calf rearing building as a venue for your special day. The Civil Ceremony Barn can be dressed by Mudfords to the choice of your decor making your day very special. After the ceremony the beautiful barn conversion can be used as a extra room to the main barn for more seating or a games room. The Civil Ceremony Barn can accommodate parties up to 100 guests. The main barn reception area seats up to 150 guests. We can also provide unique country farm Civil Ceremonies outside with panoramic views of the countryside and miles of Lincolnshire blue sky. Get in touch to find out more about this unique service. The first thing your guest will see when entering Satinton Manor Farm Barn entrance is the beautiful old rustic barn wooden doors, bare brick and exposed wooden beams. This area is a great start welcoming your guest with pictures of the bride and groom displayed on the walls and beautiful decorations matching your theme. This beautiful entrance then draws your guests into the main barn area ready to see the dressing of the barn. To one side of the bar area, we have a converted stable with old brick walls and large exposed wooden beams that can be dressed in your wedding theme. This provides a space to relax with the guests or for children to play out the way of the main barn and all the noise. There are also wooden double doors allowing guests to use the outside space, weather allowing of course. The Bar area is a converted stable block with large exposed timber beams that can be dressed to match your wedding theme. This area can be configured to suit your needs depending if you want to bring your own drink (no corkage) or have a third party provide the drinks (we recommend Keymarque bars ). Seating plans and guest books can be set up here to give people space to interact with them. In the summer there are double wooden doors that can be opened to provide panoramic views over the beautiful Lincolnshire countryside. The main barn area boasts high ceilings with sandblasted Langworth brick which shows the timber beams at their best and is fully carpeted throughout. We have Mudfords who can dress the barn to match your wedding theme. At some of latest wedding parties they have installed starlet linen covers and chandeliers in the roof or dark linen covers with lights to give a starry night sky effect. We pride ourselves in giving the wedding couple a choice of the decor to make them feel very special , on their wedding day. The Barn is only used for one wedding per week and preparation starts Monday of the week of the wedding. It is available for the wedding party from Wednesday onwards. Our beautiful rustic barn venue will accommodate up to 150 guests and don’t worry about parking we have plenty of space. We can provide onsite catering from the Bowser Brothers County Hog Roast catering service. Spit roasted hog with sage & onion stuffing, apple sauce all served with Starbucks bread. All meat is free range and locally sourced. We also provide a selection of hot & cold canapés. A good selection of freshly made salads, hot new potatoes and a dessert range plus the option of tea and coffee. To find out more about prices and menus pop over to the catering page and have a look. If outside catering is required a Platage fee will be charged. Just to one side of the main barn entrance a new toilet block has been built. This was converted from the old corn drier and sack storage area in 2016. Absolutely fantastic evening, thank you. Hire our beautiful rustic barn for a private party, we can also provide catering for the event. Are you interested in booking Stainton Manor Farm? If you are considering hiring Stainton Manor Farm for your wedding reception or private party, please feel free to get in touch. Dates book up quickly, so we recommend you contact us for availability.